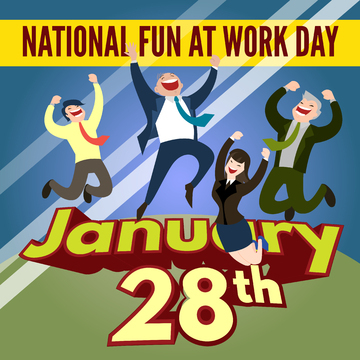 National Fun at Work Day is an unofficial American holiday on January 28th, but we’re proposing that it be celebrated world wide! Having happy employees is not only better for them, it’s better for your bottom line. Of course, creating a company culture that contributes to happy, engaged employees is a year round effort, but if you’re looking for a way to kick off the New Year with fun, try some of these tips for National Fun at Work Day. Put small basketball hoops in the office or the break room over the trash. You can even get your riders involved in the fun, and you just might find that you end up cleaning up less trash at the end of the day. Start a box of silly toys and trinkets, and keep adding to it throughout the year. A whoopie cushion, a toy sword, masks… Don’t hog all the fun for your employees! Consider how you can brighten your riders’ days too. During the morning meeting, have the person speaking wear a funny hat. Anyone who wants a turn talking must wear the hat. Do you already have an especially fun employee on your team? Create an award for the Funnest* Employee of the Year and give an award like an enormous beach ball. Get the team revved up about who will win the award for 2016 and the types of ideas that will work within your business. *Funnest isn’t a word, but it will drive the grammar police in your company crazy. Give everyone a “page a day” calendar with jokes or funny quotes to brighten their whole year. Start a new routine of doing stretches, deep breathing or a joke at the morning meetings. Ask each employee for interesting trivia about themselves, create a puzzle with the information, and pass it out on Fun at Work Day. Give a prize to the employee who matches the most bits of trivia with the correct employees. Take suggestions for names for each one of your transit vehicles. On Fun at Work Day, put up pictures of each one and the name suggestions. Employees can vote by writing the number that correspondences to the name on a bite sized candy bar with a permanent marker. The person who suggested the winning name gets to keep the candy. Have a white elephant auction and potluck to celebrate FUN! Fill the break room with balloons and beach balls. These ideas were taken from or inspired by Workplace Fun Ideas by David Koutsoukis and 52 Ways to Have Fun at Work by Baudville. And finally remember, that Have Fun at Work Day should be an attitude that lasts the whole year!